Roman Catholic's mock trial team, front row from left: Billy Rubin, Andrew DiCicco, George Zindel (captain) and Jonathan Lai. Second row from left: John Pensabene, Vincent Capitolo, Philemon Tedros, Kyle Westerfer, Michael Schwoerer, Anthony Nguyen, Nick Guth and Steve Patton (head coach). Back row from left: Paul Dunne, Pat Prendergast and Eric Von Hofen. Roman Catholic High School’s mock trial team captured the city championship with a win over Girard College Saturday, March 15 at the Beasley School of Law at Temple University in Philadelphia. 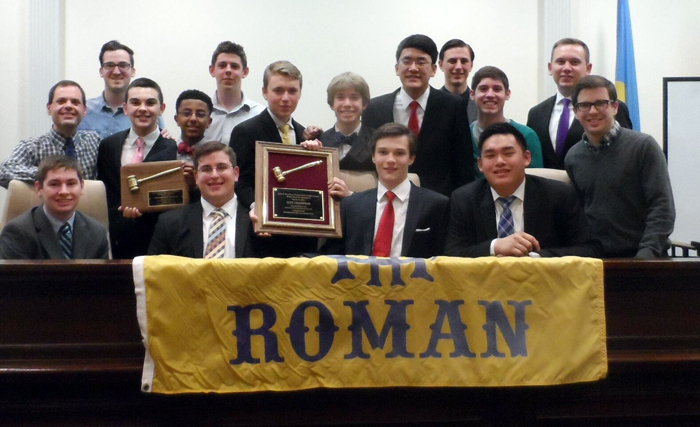 Throughout the season, Roman’s mock trial team placed in tournaments at Yale University and the University of Pennsylvania, and won the mock trial tournament held at the University of Pittsburgh. Roman last captured the Philadelphia city championship in 2010. Members of that team are now part of the coaching staff.